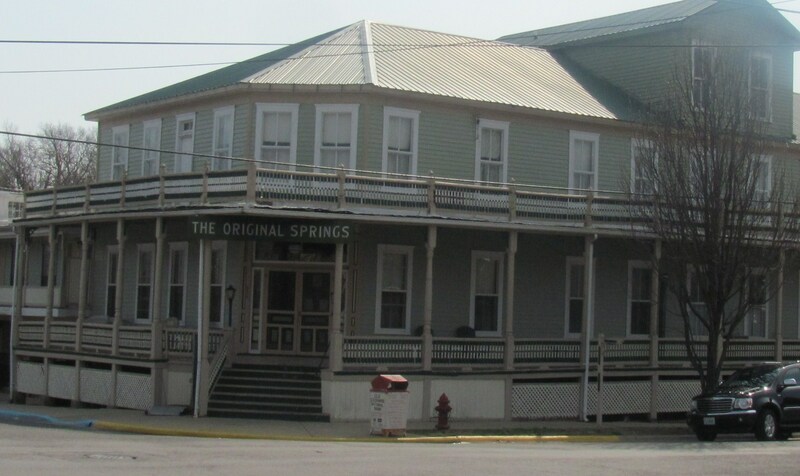 The hotel was established in 1867, because they discovered medicinal mineral spring water, but a fire completely destroyed the original building in 1891. The current building that replaced it opened on May 1, 1893. With so many years under its belt, it is only natural it should be home to many spirits. Although this was our first visit, Zach, Brittany, David and Trish had stayed there in September of 2010. They had rooms by the pool and that night Trish had seen a rather large shadow pass their window...at 3am? According to David, he couldn't figure out how anyone could cast such a large shadow over the window or even why anyone would be walking down that dead-end walkway at three in the morning? The Bar had been closed for more than an hour? It was enough of an experience that Trish said she didn't want to be facing the window for the rest of the night. David and Trish would be joining us the following day, but the first night I would have to be a lone investigator. As we pulled up, I was immediately taken aback by the beauty and old style charm of the building. Upon entering the front desk area, I was not disappointed...beautiful and charming as well! I was shocked to the core when we were handed the room key...a real...made of metal key! My children have never seen an actual key for a hotel room other than the cards. That is something that harkens back to the olden days of yore! Our room was next to the beautiful indoor pool, which filled my children with pure joy! It wasn't the grandest of rooms, but sure made me feel like I was in a 1960's time warp. My husband and I loved it! We all enjoyed the pool and restaurant within the hotel. It was a quiet calm night in general. The next day, David and Trish arrived. They had requested room #1, said to be haunted by a lady in white. It was a small room, but was beautifully decorated to honor the Civil war. We enjoyed quality time together, dinner, chatting?walking around the hotel with K2 meters, digital recorders...normal everyday stuff one would do when you are at a haunted hotel! David, Trish and I were graciously granted after hour's access to investigate the Bath House. The upstairs section is the Spa area, which focuses on massages and skin treatments. The downstairs are where the mineral baths are located, basically a series of small rooms each with its own bathtub? Not quite the communal Roman Bath I had envisioned. During their previous visit Trish, Zach and Brittany got a knocking response while they were in the downstairs bathhouse, but never found a logical explanation as to what had produced that sound. Upon entering the bathhouse, we went into darkness with only our flashlights to lead the way. It wasn't long after we entered the spa area that Trish's meter was sounding its alarm that an EMF spike was occurring. David, one of the more skeptical of CAPS members, was convinced it was reacting to a power source in the room. We women were not as convinced! It went off again in another section later, and we got several EVPs to back it up! After we investigated the entire bath house, we made our way back to room #1. We pulled out some dowsing rods and did a questions session. Once again the meter was going crazy...insane really! After some time, it quieted down again. About 2 am we decided to venture forth and walk around the hotel. We noticed there were several women out, apparently also ghost hunting, except not nearly as stealthy as us! They were on the main floor level, and we were on the second floor overlooking the pool. Surprisingly, one of them began yelling up at us wanting to know if we had come across any activity and advising us they had some batteries drain in a section we had yet to investigate. Although paranormal investigating is certainly exhilarating, it is always wise to understand your surroundings and remember common courtesy. This is after all a hotel and some people were actually here for the lodging! We ended our investigation, quietly, around 3am. The lady in white did not make an appearance that night, perhaps next time! We captured some great EVPs, but most importantly it was a fun, relaxing time! My kids are just as anxious to return as I am. I think it is imperative for the CAPS women to investigate the bath house, while being pampered in the spa, just to see what kind of activity might go on during the daylight hours! Bath house, Trish meter going off. Woman says "Tom...."
Bath House, Male with accent saying, "I like them..."?